Why is my station no longer available? What can Broadcast Partners do about it? Weather-related interference is usually caused by continuous high-pressure areas above the sea, but there are other causes as well. 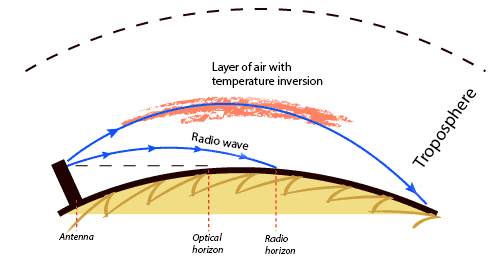 Temperature inversions can cause radio signals to deflect, which can result in more interference in other locations than planned under normal circumstances. Fortunately, disruptions of this nature are very rare. It goes without saying that a broadcast operator can not influence the weather. If tropospheric propagation is taking place, it is (unfortunately) impossible to take concrete measures to reduce the subsequent effects. It is often a matter of waiting to see how the weather develops; preferably for the worse, ironically enough! The chances of weather-related interference taking place every so often are taken into account during international frequency coordination. When requesting or modifying FM frequencies, Broadcast Partners strives to ensure that their clients' frequencies are as solid as possible. Do you have any questions about how the weather can influence your FM reception? Broadcast Partners are happy to assist you. What types of atmospheric disruptions are there? How do they occur? Read more in this document.